i do the exact same thing! usually i'll pull a couple blooms from my kitchen bouquet to spruce up the bathroom counter-- and like you said, it is motivation to keep things tidy! I love to spread flowers throughout the house - by the kitchen sink, on the dining room table, on the mantle, on my bedside table... a few blooms in lots of places is the best! Amen! $3 Tulips and also I love simple potted primroses they last longer and brighten up a dreary Jan. those run about $1.50 and a great wrapped as little gifts to brighten someone elses day! There is nothing like fresh flowers to brighten up a room. Instant face lift! I love flowers and succulents in my bathroom. It seems to add beauty and fresh air to the space. I think I'll be running by the store on my way home to do the same. One of my favorite places to put flowers! I feel it draws attention away from the tiny, plain, and probably sometimes dirty bathroom we have on the first floor of our house. 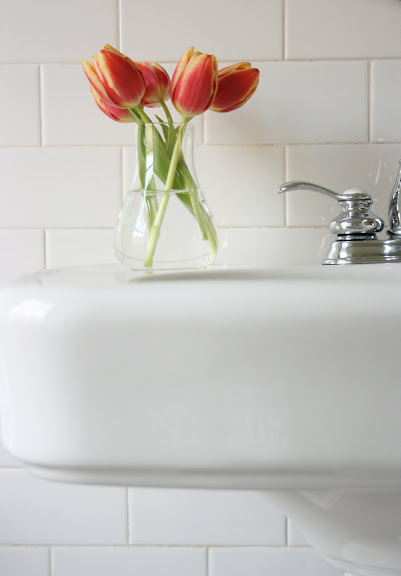 oh yes, I love having flowers in the bathroom... it's a little treat in a spot that often gets overlooked in terms of decorating! when we moved into our sunny house in may, I was determined to have a little green plant (in a little ben wolff pot) in each bathroom and they always make me happy. (for just dollars each. & I only water once/week.) I can't get enough of the tulips either.. great choice. it's such a pretty bathroom too. how lucky. love all the white. I think I need to live in your part of the world. $3 tulips ... unheard of down under in the tropics. Actually, $3 any kind of flowers. i hear you! i LOVE putting flowers in my bathroom. i don't really see it elsewhere, but it cheers me up instantly. ps - welcome to seattle! i'm excited to read your seattle-related posts. Oh I love tulips! They're my favourite flower.